My friend Ellen asked me to create something for her website Classroom. Me personally? I visit the Ellen Hutson classroom for 3 reasons...they have great step by step tutorials, they try products I don't own, and there are lots of up close pictures (I need lots of pictures). Today, the step by step tutorial to make a cute little mini is the classroom project. I hope you will stop over to see it...get out your sewing machine girls! Then come back here for a little giveaway. Just make a comment about what you found over at Ellen Hutson...just that easy. A winner will be picked at random on Sunday night and I will post the name on Monday morning. Just look at what Ellen is giving away to the winner! Hummm...I see some of my favorite things. Sandra, will you bring a sewing machine to class? That would be so much fun...I love adding sewing to any project! Great to meet you in the classroom having fun with this darling little album! Thanks for the chance at some yummy blog candy too Ellen! Well lets see. I found that you travel the United States and the world teaching your tricks of the trade. But apparently St Pete, FLORIDA isn't on your list! So sad. Because we are really nice here in the Sunshine State! The first thing I saw was your smiling face. Then I read your tutorial and looked at some of Ellen's for even more inspiration. Thanks again for sharing. This mini is so pretty. Your tute was very easy to follow. I might have to get some Distress stains now. Hope you guest again on Ellen's blog. Thanks. That was my first visit to the Classroom...but I can say that it won't be my last! Great stuff going on over there. How did I miss it???? Thanks for sharing. Thx for the tutorial, your mini is gorgeous and now I can use that canvas that I have in my stash. You have the most clever ideas! I need to build on my distress ink collection! What a great project idea and the tutorial is so helpful. Thanks for the great ideas you always have. Congratulations on being a guest designer for Ellen! I love your envelope journal project with the step by step tutorial. And that turquoise is a great color during the somber winter months. While over at Ellens site I had to take a look at your tutorial. Great little album, always a little bit intimidated to use a sewing machine on paper projects but you made it look easy enough for the album and the fall leaves you did! Love the napkins with the leaves. Also while at Ellens I seen she carries supplies for soldered art and art parts. Who knew! Thanks! Great tutorial at the CLASSroom. I like your use of stains and the sticky back canvas on this wonderful mini album. Yup.....Ellen's description, of Paula's many talents, in the introduction was perfect. I enjoy Ellen's site and great tutorials and product info. The project was FANSTATIC. Something I will definately try. I was delighted to see that some of the producticts I needed were on SALE on Ellen's site. What a bonus. Thanks again for all the inspiration. I love your project, just may have to give it a try today. Love the way you put together the cover and binding. Thanks. Congrats Paula! Your tutorial makes me want to go right downstairs and play. Only problem is I need that die cut and would love to have the archival inks in aquamarine and viridian. Those are beautiful colors! I loved your mini book. The tutorial was clear and easy to follow. I love finding new ways to use my dies and this is a great idea. I really like the idea of using the sticky back canvas as a cover, it makes it very sturdy and looks like it will hold up to lots of handling. And I love the color you chose for the cover. This would make such great gifts, each could be personalized for the person you want to give it to. The bookplate on the cover just makes it extra special, PERFECT! Wow what a fabulous little album! I've been holding off getting a sewing machine but this sweet little book of yours could push me over the edge. Thank you for sharing with us. Loved watching your step-by-step process...so well done. Saw your project over at The Classroom. Great tutorial and love your use of the canvas. Coming from the CLASSroom blog - love your mini album. Great color on the cover and ribbon.I'm going to have to make better use of my Distress Stains and add more colors. Thanks Paula. I saw your mini album on the Classroom blog and I loved it. Thanks for the tutorial and all the tips. You're going to make me buy more Distress Stains. Oh dear, now I have to sit right down and make one of these. They are just fab! And Ellen's site has so much to offer, from shopping to inspiration...a one-stop gotta see! Thank you for such an easy to follow tutorial! Love the wonderful album tutroial. Now I think i need that die!! Bookmarking this blog in my reader so I can catch all the wonderful ideas!! Thanks for sharing the cute little mini album with all of us! I just love Ellen Hutson for my shopping needs! That mini was great....and it was also great to associate a face with a name, I don't think I had seen a photo of you before. As always I so appreciate all the steps and photos you show. So helpful! Your album on the classroom is charming and I am enjoying reading your blog. Pretty mini album and great tutorial! Now I need all the supplies as I have none of them. I really would like to give it a try! Thanks! Welcome Paula and I look forward to being inspired by your creative projects and ideas! I love your mini project for the Ellen Hutson CLASSroom. The colors are beautiful together. 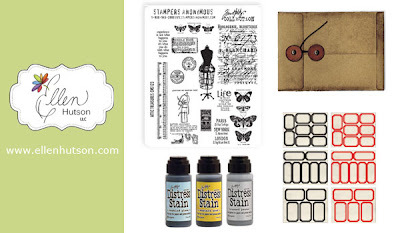 I hope to win some of these supplies as I am building my collection being new to card making. Thanks for the chance to win! Very cute mini album. I have never been to Ellen Hutson classroom before. I always find wonderful projects in the classroom at Ellen Hutson's great site! To see your mini album project there was icing on the cake! It's adorable! Thanks, Paula! I want to comment - but not to win (I have all of these supplies). I love the way you used the small flap on the envelopes to sew them onto the book cover- that is an awesome time! Happy Creating! Sweet album, thanks for a chance to win. I have been coveting the pocket envelope die for some time. I love how you used the pocket envelope die and your sewing machine!!! The Ellen Hudson site is "dangerously" fun! Thanks for the chance to win!! Thank you for inspiring my creativity!! Really fun way to make a mini-album with pockets. So cute. Thanks for a chance to win! What a beautiful mini album! You used so many wonderful products in creative ways, and I'll be able to use those techniques on other projects, too. Thank you for introducing me to Ellen's website. Love your tutorial on The Classroom blog! This is a sweet way to make an album and I really appreciate all the detailed pictures. Also, you've taken the mystery, if you will, out of products I'm not very familiar with - Distress stains and sticky-back canvas specifically. What great products! Thank you for sharing your techniques and product uses! Even if I might not make mini albums myself, I am still so inspired by the art! Thanks for the lift! I love how you created the colors in your mini album - I've saved the directions so I can give it a try. Thanks! I found a great tutorial at The Classroom! Thank you for sharing your creative brilliance. It's fun when sites I browse co-mingle! Gorgeous mini thank you for the tutorial! love ellen's site....what's NOT to find?! your mini album is great, can't wait to make one :) thanks for sharing! i love ellens products. she's my go to for ranger and memory box supplies. your mini album is awesome! great job! Love the sewing! You are always so inspiring. Thank you and Happy Thanksgiving! Love your album - especially the color. I browsed around and saw lots of fun inspiration and product. I love ANY new idea (for me) for inky backgrounds! LOVE the combination of these two colors...and the beautiful result. This is one special little album. What a cute little book! I also loved the leaves your did in the last posting and I can't imagine all the work it was to post! Thanks for your tutorial, it's a beautiful Christmas present idea!!! Having just discovered your blog, I am about to venture into all the goodies you two have created!!! Thanks very much for the tutorial on this adorable little book. I love the colors...so very pretty!! Your mini book is amazing. Love the distress stain technique! Paula, One of the reasons I like to visit Ellen's web site is that I find wonderful surprises like your mini journal tutorial. Thanks so much for sharing your work. Love the tutorial in the classroom! Just getting to know Ellen Huston recently placed my first order with her and found an awesome Ellen technique on Pinterest that I've tried three times already! Color blocks of alcohol markers splashed with blending solution and then stamped over! You gals Rock! Ellen's classroom always has great tuts. Your mini book is great! I continually stop there to learn something new. Thanks for the opportunity to win great prizes. Love the tutorial! Never visited Ellen Hutson before so enjoyed the visit. Thanks for putting it all together and for the giveaway! What a delightful mini-album! THANK YOU, Paula, for the very helpful tutorial, especially showing one way of using the sticky back canvas with the Ranger Inks. Your color choice is so cheery. Ellen's website has so many wonderful products that I hope to try in this lifetime!! I like your little mini book! Your tutorial is so clear I think I could make one! What a great job Ellen did with the tutorial! I'll have to dust off my sewing machine! I need some aquamarine archival ink also & I never heard of Wonder Tape...must look into that. Thanks for the inspiration! i loved the album and the great instructions! love the aqua and yellow together. What a great project on Ellen's site, love the idea. Going to put that on the weekend "to do" list. I think this album will be a great gift! Thanks for a great tutorial. It's been ages since I've checked out Ellen's classroom...thanks for the reminder I need to make myself a shortcut to it...Loved the colors you used! Love the mini album!!! I am definitely going to try it. Great tutorial. What a wonderful mini album and thanks for directing me to another great website to follow! It's a gorgeous mini album & the tutorial is excellent. I loved this little mini album. After seeing all your detailed pictures, I'm motivated to give it a try! Thank you for sharing this cute creation...I know what I will be making for gifts. This project is amazing and I really want to make one too! Thanks for showing all the steps so clearly - so much fun!! Ellen's Classroom is a wonderful place and she showcases the best talent out there! Thanks so much for sharing your creativity!! Good thing I just bought the envelope die. I'll be making that cute little mini this weekend! I love the mini album tutorial! I especially noticed two of my favorite techniques - using rubber stamps without a block for a more organic look AND using my sewing machine for added texture. Well done! Love your album. It's beautiful. Thanks for sharing in the Classroom. awesome tutorial! THese will make great christmas presents to my nieces... Love it! Your little mini album is fantastic! I always forget about sticky back canvas and its many uses. I hadn't heard of Ellen Hutson before, they carry a lot of goodies and their website is easy to maneuver. 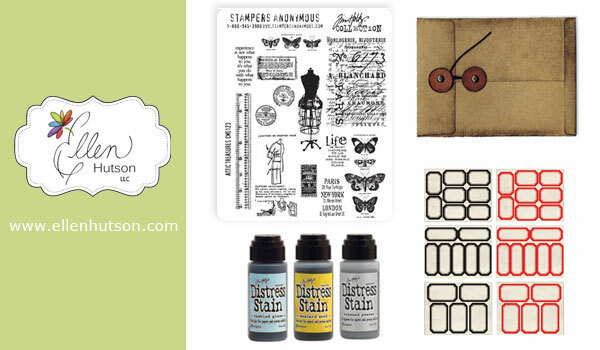 I found a few things for my wish list, Graphic 45 Birdsong paper and Ranger's Aquamarine Archival Ink Pad. Thanks for the tutorial, I love any excuse to use paper with my sewing machine. I have been a follower of this blog for a while, so was tickled pink to see you featured over at The Classroom! just love this gorgeous album! :) thanks for always inspiring, even if I don't always leave a comment. Thanks, Paula! Another AWESOME tutorial. (and I am NOW going to HAVE to get that envelope die!!!) Saw Ellen's email and visited her CLASSroom, only to find YOU! LOL! So funny, because I have your blog on my google feed, and make sure to check every new post. :-)Thanks for the chance to win some goodies!!! Lovely tutuorial, I will definitely have to get that envelope die! I also want the new Ranger Distress Stains that Ellen is carrying! Thanks for the giveaway!! I'm with you Paula, Ellen's blog is a great one for ideas; but so is yours!!! I LOVED the mini you made! I had just bought some sticky back canvas 2 weeks ago, and had made some cute cute outs using my Vagabond (planned to stain or ink the pieces and use them on a mini) and now I am super inspired to make a special mini! Loved how you sewed the two pieces back to back!! LOVE the little mini !!! Thanks ! Gorgeous mini album, Paula! I love how you used the distress stain technique on the envelopes. That little touch of shimmer from the metallic is fabulous. Thanks for a great tutorial. I have both your blog and The Classroom blog bookmarked because of all the creative ideas I glean from them. I really liked the way you sewed the pages into the album. And the colors were delightful. Thanks a bunch. Thanx so much for sharing this adorable album. I follow both your blog as well as The Claassroom blog. Read your tutorial at The Classroom. Thank you for all the pictures! Even though I read the instructions, pictures say so much more. fabulous detailed tutorial...well done...looks easy and doable..thanks for the opportunity! I really like the step by step instructions. You are always so good at that. What a great little project that could be altered to fit any theme or occasion! Love your art-thanks for sharing! Thank you for the great idea for my envelope die. I loved the coloring technique,too. What a great mini album. Love the colours, and the stitched binding. Gotta try that myself! I love your little album! It's beautiful! I especially love how you made the cover. This was my first time visiting Ellen's classroom, so THank You! Loved the mini album especially the fun colors!!! Dear Paula, I love everything that you're doing, and this darling album is just another wonderful masterpiece of yours. The ability of your eyes to see beauty where there isn't anything yet, and the power of your talent to make this vision a reality just makes me happy. Thank you. Great to read about you @ The Classroom. my first visit there, but I 'll be back! Love your work, and that you share! Your album looks amazing and the steps are so easy to follow. After looking around Classroom I fell in love with the Hello Monday tutorials, they demonstrate so many techniques in such a fun way!! That is a great little album. Love it! I love the envelope mini album you created. I've been wanting that die, now I must get it. Thanks. I found a great "NOEL" die at Ellen's.. have been wanting one for Christmas card making. I liked your tutorial very much, would love the goodies!! I love ideas for mini albums...and that one is too cute! Love Distress Stains, too. Love te minibook, and how you did make it. Great page at Ellens. love it, wil come back more to see the beautiful things. Thank you for the pictures and step by step instructions. You are right, that is my favorite part of the Classroom. Great inspiration. Thanks so much! Whoops, forgot to comment on Ellen Hutson's site. I found the new Distress stains. Aren't those colors magnificent! They are on my Christmas wish list. Paul, thank you for sharing such a neat little book! How clever to sew the envelope flap to the book! I'll be making this little guy!! what a great project!!! I received my Christmas Tree package and I am getting ready to dive in to putting it together! So excited about it! I would love to have a schedule of your classes and where you will be in 2013. I would love to take a class from you! Love, love, love your mini album. I shop at Ellen's whenever I need anything, she generally has everything. I am putting you mini together now, just have to get the sewing machine out to finish. Thank you. Beautiful mini album! Such a great color too! Love it! Always a treat to shop at Ellen's... great service every time I've ordered and a great selection! If that isn't the cutest little mini album ever! You are so crazy talented!!! A very nice mini album. A great and easy way to add color to the pages! Thanks. I love her dies and vintage-looking projects. Way to go! What a fabulous tutorial! I loved the step-by-step and the photos. I made one of these mini albums last night as a gift for a friend and it turned out wonderfully.